Andy Langdown is a Consultant Orthopaedic Surgeon based in Portsmouth. He works at the Queen Alexandra Hospital, Spire Portsmouth Hospital and Nuffield Health Chichester Hospital. His specialist area of interest is surgery of the hip and knee, including primary and revision joint replacement, ligament reconstruction and arthroscopic surgery. In addition Andy Langdown is an accomplished trauma surgeon, having spent time as a consultant on the specialist regional trauma service in Oxford.After graduating from the University of Birmingham in 1993, Andy Langdown spent a year teaching anatomy to medical students in Bristol and was also involved with numerous repatriations of sick or injured patients from abroad. His basic surgical training was completed in Bristol and involved placements at the Bristol Royal Infirmary, Frenchay Hospital and the Avon Orthopaedic Centre. In 1997 he became a Fellow of The Royal College of Surgeons of England. In 1999 Andy Langdown commenced his specialist orthopaedic training on the Oxford programme. During this time he worked in recognised centres of excellence such as the Nuffield Orthopaedic Centre and The Trauma Unit at The John Radcliffe Hospital. He passed the Intercollegiate Specialty Exam in Trauma and Orthopaedics in 2003 and obtained specialist accreditation on the GMC register in 2005. Having worked with several world-renowned surgeons in the field of adult hip and knee replacement, Andy Langdown was appointed in 2004 as a Fellow in Lower Limb Arthroplasty and Reconstruction at The Concord Repatriation Hospital in Sydney, Australia. 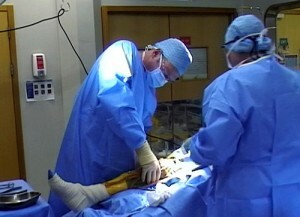 During this year he gained significant exposure to modern techniques in hip and knee replacement such as minimal access and computer assisted surgery, plus major experience in the use of modern implants with improved longevity. During 2004 Andy Langdown was also employed as a Research Fellow at The University of New South Wales and was involved in several basic science research projects investigating tendon-bone integration, fracture healing and interaction of orthopaedic implants with bone. He has presented at many national and international meetings and has published articles in many of the leading orthopaedic journals. After seven months working as a Locum Consultant on the Trauma Service at The John Radcliffe Hospital in Oxford, Andy Langdown was appointed as Consultant Orthopaedic Surgeon in Portsmouth, commencing in September 2005. His current practice covers all areas of hip and knee surgery and post-trauma reconstruction. His particular interests are arthroscopic surgery of the hip and knee but Andy has a well-established practice in hip and knee replacement surgery. He is a founding member of the Portsmouth Arthroplasty Group, founder of the Young Adult Hip Services in Chichester and Portsmouth and is a member of ISHA, the International Society for Hip Arthroscopy. Andy is a high volume hip arthroscopy surgeon, performing on average 200 arthroscopic hip operations per year. He is committed to preservation surgery of the hip joint. Andy Langdown also has a strong commitment to medical education and has examined undergraduate medical students in Australia and the UK. In addition he has been an invited examiner on specialist orthopaedic revision courses in Australia and has been a member of faculty for both the Oxford and Wessex Orthopaedic Specialist Examination Revision Courses. He is a member of the Smith & Nephew National Advisory Panel for Hip Surgery. In addition to a busy clinical practice Andy Langdown has maintained an active interest in orthopaedic research and is currently involved in projects concerning the results of arthroscopic surgery for hip impingement and treatment of lateral hip pain due to abductor muscle dysfunction. A family man, Andy has 2 teenage children. He has a keen interest in sport – he is a lifelong Manchester City fan and has a keen interest in competitive cycling. He holds several Wessex Veterans time trial records, has won numerous Wessex Veterans time trial trophies and represented Great Britain at the Amateur World Time Trial Championships in 2017. A recent convert to track cycling, Andy has won medals at National Masters Track Cycling Championships.